Anna Clara Heinkel, 1866-1944, the oldest child, was born in Illinois. She was involved with the early development of the Pass-a-Grille area which her father had homesteaded; at one time she owned property from the tip of Pass-a-Grille to the Don Cesar Hotel, and it was in that area that she built and operated the Plaza Hotel which later burned to the ground. Anna was the one who took care of her mother, Mary Pierce Phillips, in her last years before she died in 1929. In the 1920 census, Anna is Annie Betts; her mother is living with her and also her daughter Eva D. But by 1929 she is Anna Heinkel. She died 14 June 1944 in St. Petersburg and was buried in Greenwood Cemetery where her parents were buried. She was survived by her husband Rudolph F. Heinkel and a daughter, Mrs. Belle Vanderview of Titusville, her brother Zephaniah Phillips Jr. and her sister Julia Phillips Whitted. Zephaniah Phillips Jr., 1868-1957, was born in Illinois on November 23d. He married Mary Deisner of Kentucky about 1895. In the 1910 census his occupation was engineer; he was living in Pass-a-Grille at the time, but by 1896 was in Titusville, Florida, where his son Zephaniah was born. Zephaniah and Mary also had a daughter, Olive Mae, born in 1900. In 1923 the family was still in Titusville, across from Cape Canaveral; Zephaniah sent a telegram to Frances Brent Whitted, expressing his sympathy at the death of her husband, Albert Whitted, who had just died in a plane crash. Albert was Zephaniah's nephew, the son of his sister Julia. Zephaniah and Mary both died in 1957 and are buried at the Royal Palm Cemetery in St. Petersburg. Gravesite of Zephaniah Phillips Jr.
Gravesite of Mary Deisner Phillips, 1872-1957, wife of Zephaniah Phillips Jr. Descendant report for the family of Mary Deisner, wife of Zephaniah Phillips Jr.
Julia Jeanettie Phillips, 1870-1949, was born in Illinois on September 25th. Julia married Thomas Austin Whitted of Disston City (now Gulfport) in 1887, the first to be married in Pass-a-Grille. Julia was involved in real estate in the St. Petersburg area. The municipal airport in St. Petersburg is named for her son Albert Whitted, a popular and well-known early aviator who died in a plane crash in 1923. Clarence Eugene Phillips, was born 06 Jul 1875 in Ohio. The family was living about that time in the area of Wheeling, West Virginia, and Bridgeport and Martin's Ferry, Ohio, Bridgeport and Martin’s Ferry being just across the Ohio River from Wheeling. Clarence's sister Julia named one of her sons's Clarence, probably after her brother. 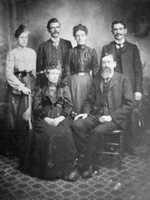 Clarence married Nellie May Carpenter in 1897 in Hillsborough County, Florida, and they had three children: Genevieve, Claude Everett, and Nellie May. In 1900 Clarence was listed in the census as a boiler maker. By 1920 he was divorced and living with a family named Reese in the town of Brandon, Florida, eas of Tampa. His wife, Nellie May had remarried in 1917 to a Mr. E.D. Strang. Clarence died on 14 February 1926 in Tampa, Florida, and was buried at Myrtle Hill Memorial Park in Tampa. He was only fifty years old when he died. Ida May Phillips was born in April 1880 in Wheeling, West Virginia. She was one month old when the census was taken in 1880 in Wheeling, West Virginia. She died the same year, age 3 months, on 6 August and was buried in East Wheeling. The cause of death is difficult to make out but appears to be Marasmus, a progressive wasting away of the body, like malnutrition, according to a list of old medical terms. Her older sister, Julia Phillips Whitted, named her first child after her younger sister: Ida May Whitted, born in 1888. The photos of Mary and Zephaniah's children were taken from photos of the family sent by Dixie Phillips Pernell and Jo Parker.